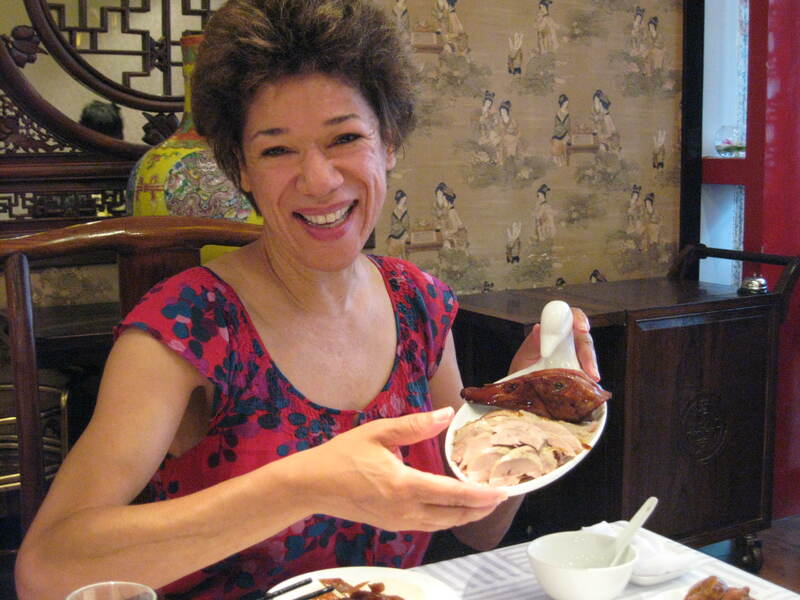 For our final foray in China, we scheduled an evening for dinner at Traditional Beijing Roast Duck –Shanghai, a restaurant on 1 South HeNan Road. We noticed this establishment several times while exploring the city plus, it was two blocks from our hotel and the concierge made a favorable recommendation, as well as the reservation. 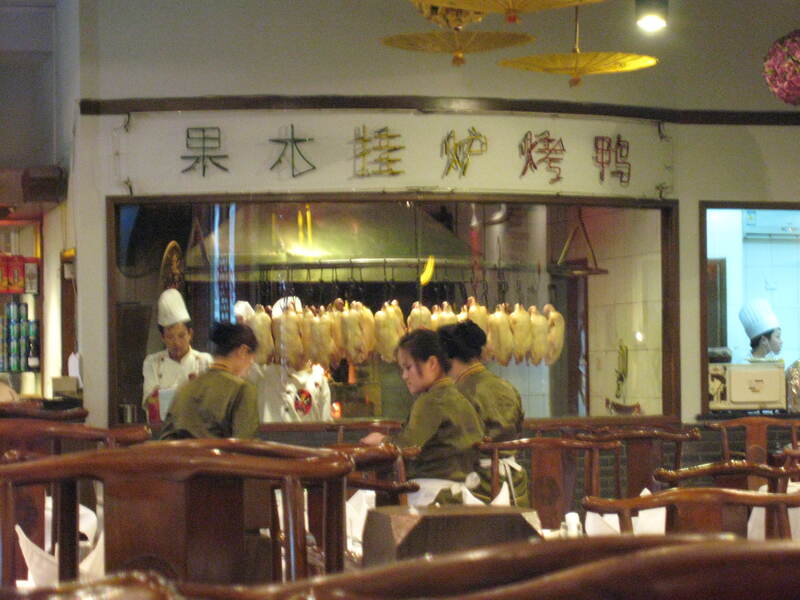 No traveler comes to China or leaves without partaking in the ceremony of eating roasted duck. We arrived early and enjoyed the quiet atmosphere of the dining area before the hungry throng of patrons converged upon the restaurant. 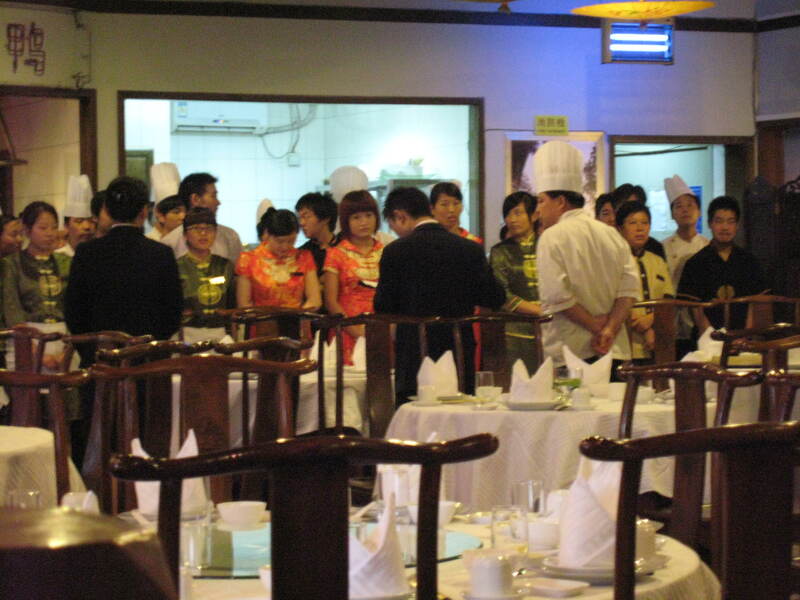 Watching the staff make preparations for the evening ahead; there were managers giving last minute instructions to wait-staff, washers, cooks, and they checked to see that each employee was presentable in their attire since, we could see into the kitchen. 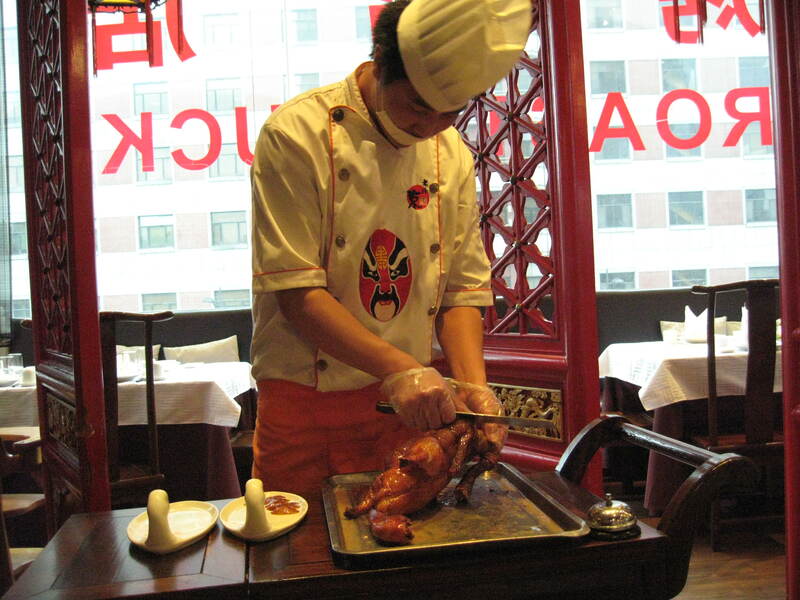 There is a great deal of work that goes into the preparation of the ducks before they are brought in for roasting. As the birds hang in the oven, a chef determines their cooking time and may swing them closer to the flames in the oven so, the skin will become extremely crispy. After much discussion, our meal was decided upon and the waitress shared the specialty dishes of the day. 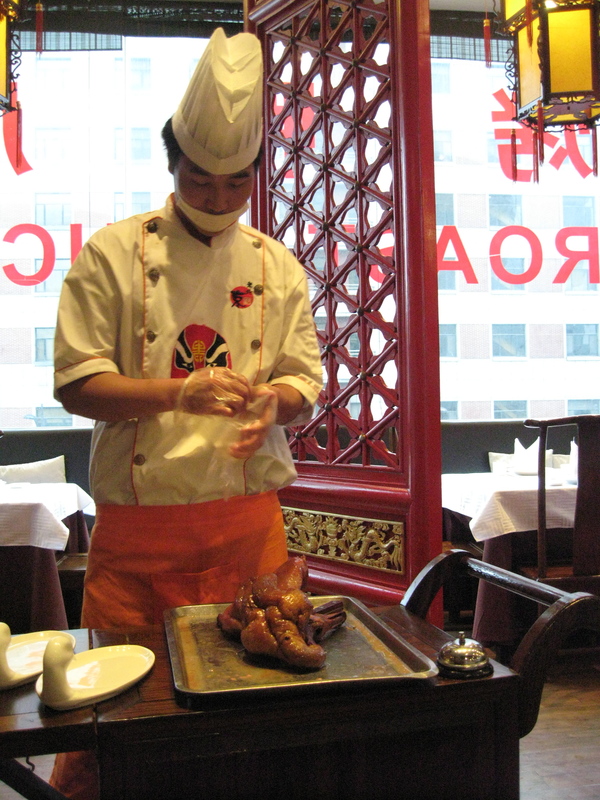 The chef carved the bird at our table with great pomp and ceremony. 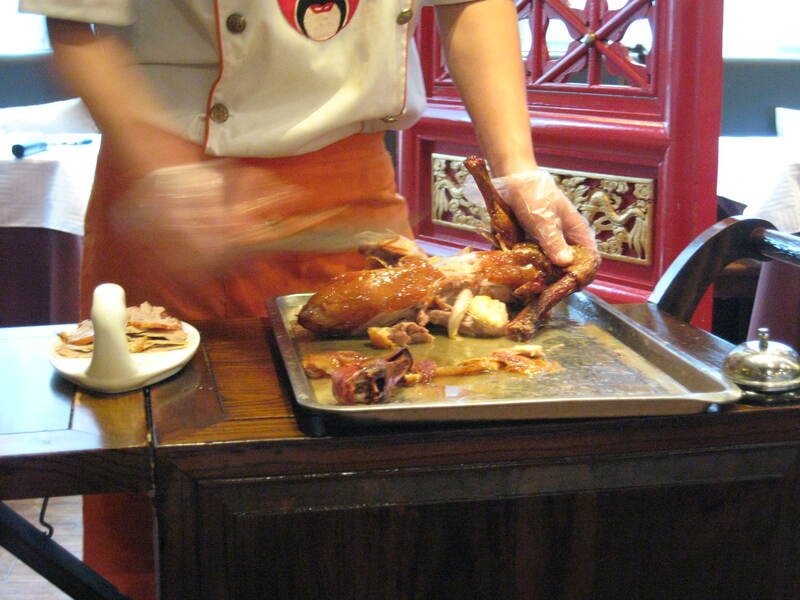 The duck was sliced to perfection including the head, which is considered a delicacy. Nothing went to waste, a bit of the fat, meat and bones were used to make soup, which was brought back to the table towards the end of the meal. 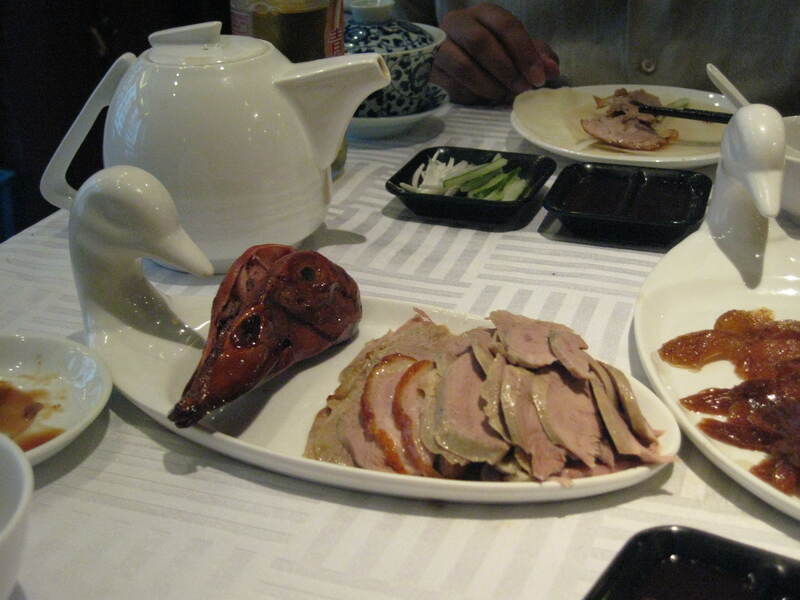 Once the duck was carved, the rest of our meal was served and it was delicious. 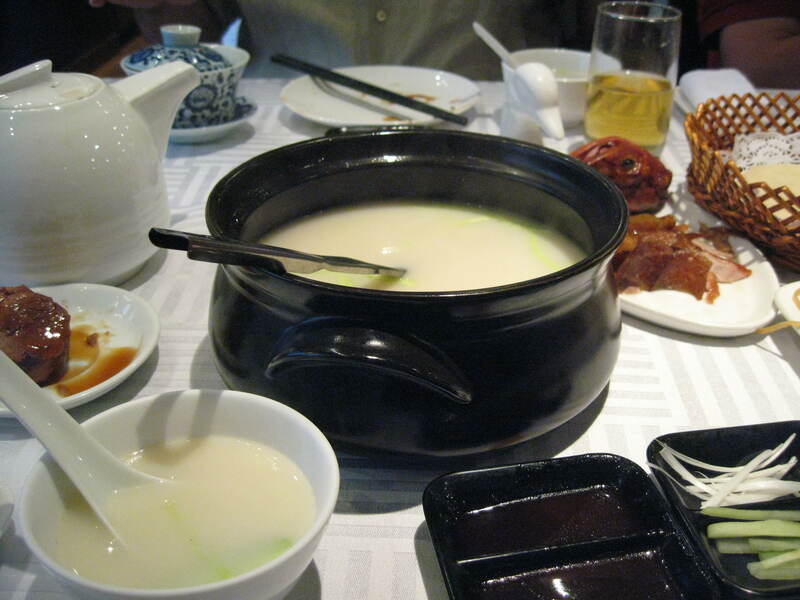 There were condiments such as hoisin sauce, a sweet bean sauce, and scallions, to go with steamed pancakes used for rolling up the duck meat and crispy skin. We had side dishes of eggplant in a chili-garlic sauce with a touch of sherry and scrumptious stir-fried string beans with lots of garlic. The overall dining experience was truly memorable and the perfect end to our trip in the Orient. But, the “Silk Road” series will continue as we move towards Arabia. I found this so interesting. Love the picture of you holding the duck head! 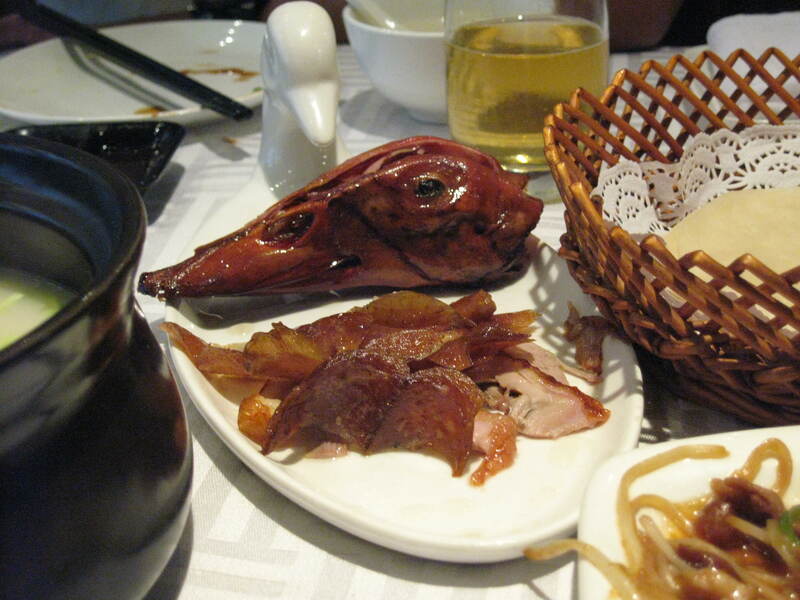 Hello Stylish Heath, hold on now…………..duck heads. Poor ducks………Oh boy! 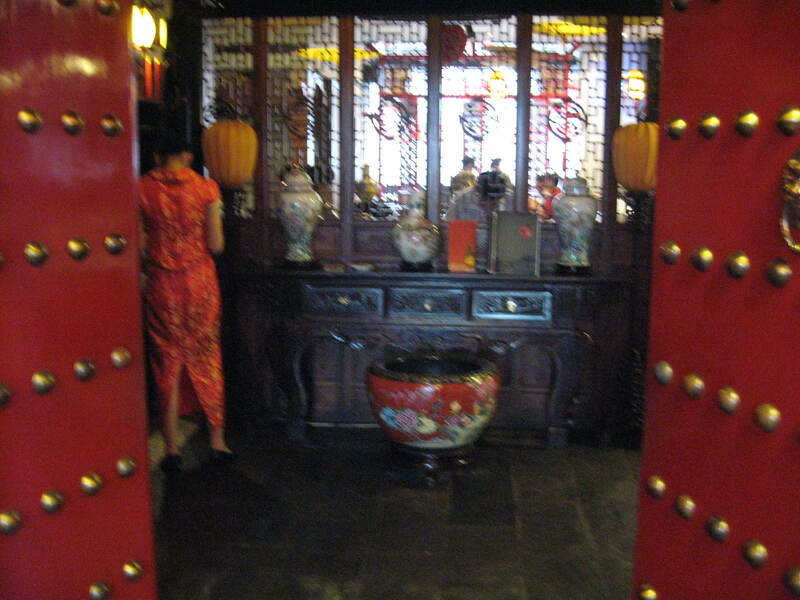 Lol……… Very nice pics of this exquisite looking restaurant. The photo of your brother and the young waitress writing down the order is captivating to me. The soup looks delicious. 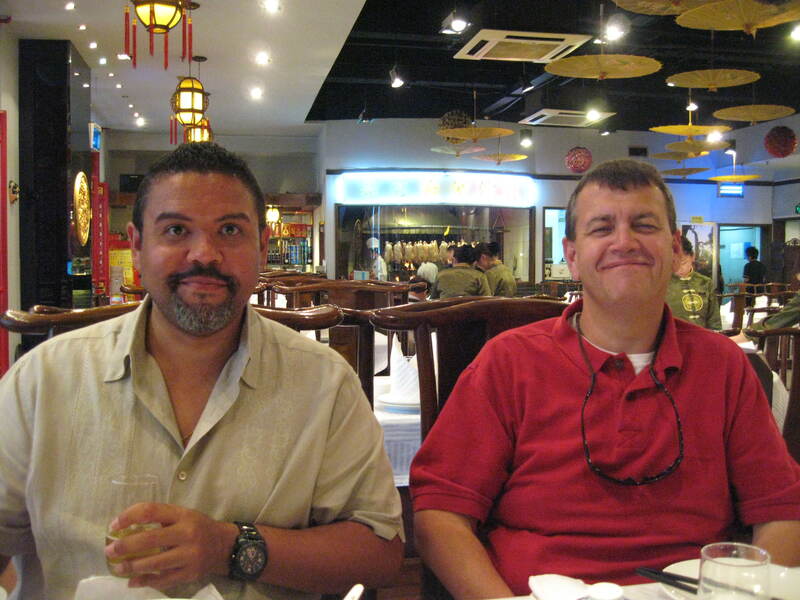 Thank you for sharing your experiences as you ventured through this wonderful city called, Shanghai. I’m looking forward to visiting your blog as you continue your trip through the “Silk Road” series. The food looks scrumptous and the ambience of the restaurant is noticeable immediately. I’m sure it was a great time and am waiting eagerly for your next post. In fact just viewing this post has fired up my appetite. Your travels make for excellent moments to share. Let the good times roll.